LT Web Design is Responsive Web Design Joomla template. It's clear and designed with light colors. This template is built for web design studios and creative agencies. It is normally used for graphic design, authoring, interface design, LT Web Design supports mobile devices with 100% responsive layout. We also provide flexible home page which includes boxed and full width layout, drag-drop layout, strong shortcodes, unlimited position, and 4 color styles. 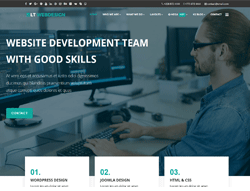 In addition, the theme has awesome sortable portfolio with CSS3 animation effects, front page slider, parallax slider and much more features helping to create flawless web design project.